Till yet , we have been sharing many cool, stylish and popular widgets in blogger which are world widely used by famous bloggers and are the demands of many newbies. Today, we are going to share another awesome widget with you which is Stylish Email Subscription Box In Header With Social Icons. 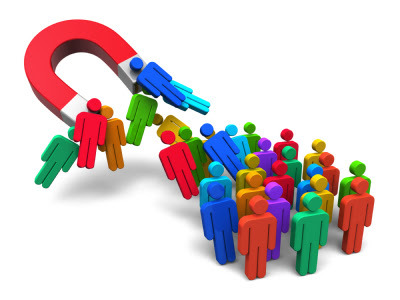 This is the best widget to make your visitors your loyal subscribers within no time. Its place is Header so, every visitor's eye can catch it easily and they will subscribe to your blog. You can also see the same widget on our blog in the header, so we always loyal content with you :). What's Special In It ? 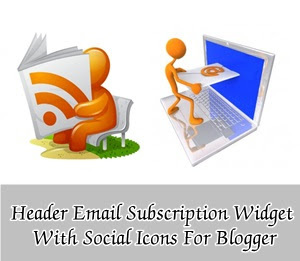 This is the stylish and clean header email subscription widget in which social buttons or icons are also available for increasing social followers. This widget is divided into two sections. Left portion of this widget is having subscription form where Name and Email field are implement along with the subscribe button. Heading and a little spam message is also available in that area. While right portion of this widget is having the social buttons which are Facebook, Twitter, Google+, Feed burner and Pinterest. This widget will surely rock because it will be located at the header area and that's the most prominent place of catching visitors attention. Click "Save" and you are done ! Today ! we have shared a worth using widget for you. Now, its your turn share thoughts and views about this widget with us. Comment below if you have any problems or queries regarding this widget and let us know if you have some better ideas or widgets of this type. Till Then Happy Blogging ........ Roger And Out ! In the world of blogging widgets have always got a high priority and infact they are considered the top source to bring traffic to your blog. Widgets are very important as they allow people to like your content and share it easily with other people. We, have always shared quality and useful widgets with you and once again today following out tradition we are going to share a nice widget with you which is name as Facebook Pop-up Like Scrolling Widget. As social media is the top source for getting free and targeted traffic so today's widget allows your readers to show your content on Facebook with other people and surely it brings more traffic to your blog. It has scrolling feature that lets it to Round UP and DOWN with the movement of Mouse Pointer. It loads Faster and appears in seconds within the page opening. How To Add This Widget On Your Blog ? 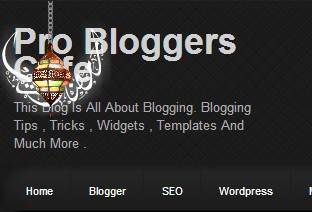 Sign in to your blogger account and the select the blog for which you want to add this widget in. Go to Layout >> Add A Gadget. Select Html/Java Script from the Pop-up tab that appears after clicking on Add A Gadget. Another Pop-up window will open. 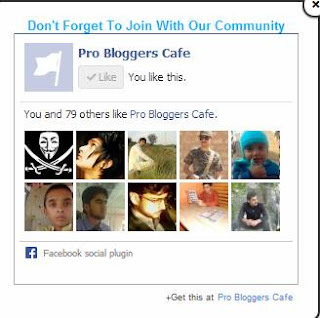 Note : Change ProBloggersCafe According to your Facebook Fan Page username. We shared an immense widget for you today. Please give it a try and we hope it will really amaze you. Now, please let us know about your thoughts and reviews about this gadget via the below comment section. Till Then Happy Blogging .... Roger And Out! Have you ever thought about decorating your Blogger Blog with something especial on the glorious occasion of Ramadan? The ninth month of the Muslim year, in which strict fasting is practiced from sunrise to sunset.Today in this article, we will show you how to add an Animated Ramadan Lantern in Your Blogger Blog. If you are curious to know how this widget looks like, then scroll back to the header of “ProBloggersCafe” and you would notice a Lantern spinning in both directions up to 180 Degree in a motion with a glowing Ramadan Kareem text written in Arabic. Below we have attached an image preview just in case if we make a decision to remove it in the future. Remember: This gadget is not only for Blogger users. Any platform that supports HTML and Flash could easily implement this on their websites including WordPress and etc. Happy Blogging ... Roger Out ! Blogging becomes interesting when people share your content on different social media sites and other websites with friends. In order to share your content on social media sites by visitors; you need to add some beautiful and smashing social sharing widgets. If your widget is looking attractive and catches people’s attention then your content might get shared by visitors. 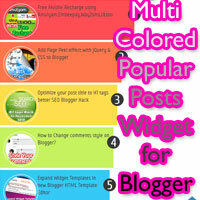 For this purpose, there has been a huge number of Blogger widgets and plugins by different designers. Today, I would like to share a floating social sharing widget with you which scrolls down automatically when visitors scroll down the page. You can see this widget on my blog. The same widget I’m sharing with you. Hey Guys ! Today I will share with you how to add a cool facebook floating like box in blogger so , that your visitors also get connected to your facebook page as it will be good for them and as well as for you. 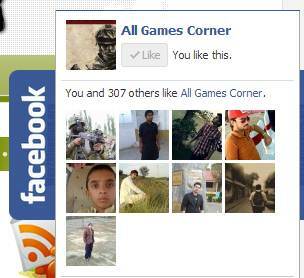 Facebook floating like box is very easy to use. You might also have seen it on various blogs/websites and you may have wondered adding it to your own blog. So today , I will be fulfilling your dream. Adding this widget to your blog gives it a more beautiful and professional look , and infact makes it easy for your visitors to stay connected with your blog via Facebook.